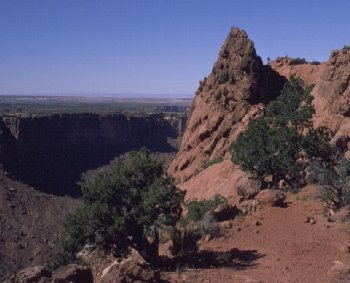 This 60 million year old meteor crater in Canyonlands National Park, Utah, is a perfect model of an impact basin, something any lunar observer familiar with basins like Orientale or Nectaris will recognize. 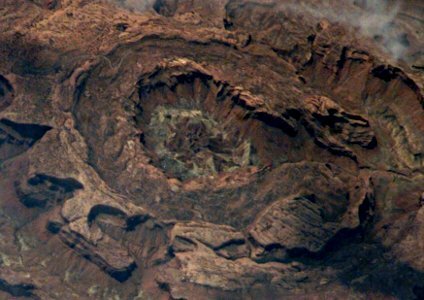 It has a central peak, terracing in the walls, and concentric rings around it. The inner crater (the smooth red wall across the chasm) is about two miles away. The outer shock rings are much bigger. 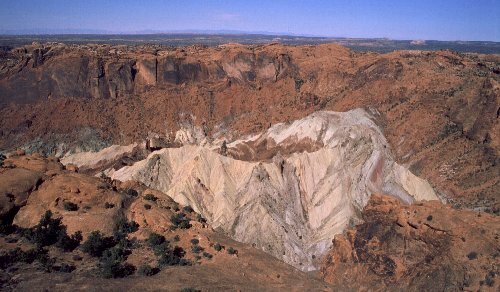 For years it was believed to be a collapsed salt dome (hence the name), but later research, starting with Eugene Shoemaker, shows that nearly all the evidence points to an impact origin. 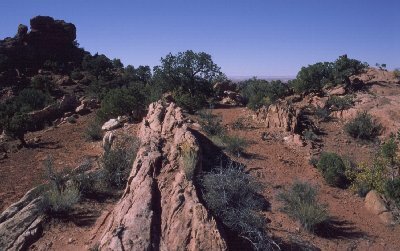 Recent (2008) research by Thomas Kenkmann and Elmar Buchner have finally put the matter to rest, finding planar deformation features in quartz crystals embedded in the Kayenta sandstone of Upheaval Dome's outer ring. 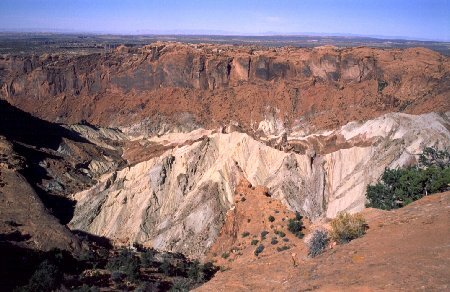 Here's their paper in GeoScience World: Upheaval Dome, Utah, USA: Impact origin confirmed. 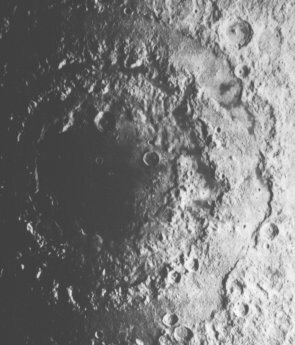 That it is an impact crater should come as no surprise to lunar observers, since Upheaval looks remarkably like a terrestrial version of the Orientale Basin, which we see in profile on the southwestern limb of the moon, or like the Nectaris basin which is more subtle than Orientale, but has the advantage of being visible face-on from earth. 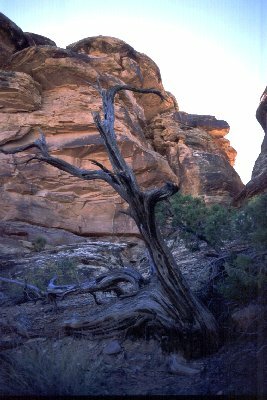 For further reading, Kurt Fisher has an excellent Bibliography of Upheaval Dome references. 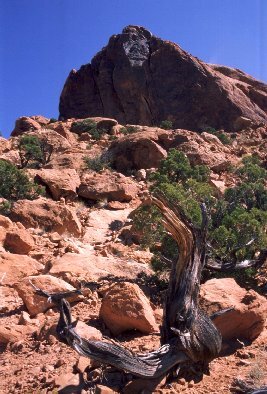 The first time we encountered Upheaval Dome, after spending a while at the overlook staring amazed at the spectacle, we attempted to hike the trail that winds downhill just inside the first shock ring to the bottom, where a spur trail heads inside the crater. Unfortunately, we ran out of water before we got much more than halfway to the bottom. 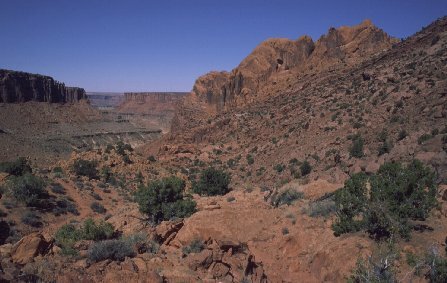 The trail continues down toward this canyon (carved by a tributary of the Green River) then bends around the bottom part of the outer shock ring -- the big red rocks looming just right of center -- and the trail to the center would be just on the other side of those rocks. Looking up from different vantage points at various parts of the outside of part of Upheaval Dome's first shock ring. Left, another view of the outer shock ring, and the way the terrain beyond it drops off into the canyon; right, concentric shock rings.